Evelyn is one of Stirling’s most loyal and long term employee’s. Her experience and familiarity with Stirling Veterinary Services creates stability for clients and staff alike. Evelyn has a strong, calm, practical manner that creates a warm family feel to the practice. 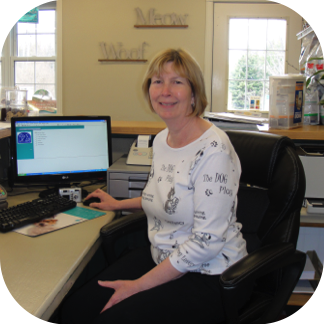 Aside from bookkeeping and finances, you’ll often find her answering client concerns or assisting veterinary staff were needed. Evelyn also enjoys travelling and spending time with her family. She is known for her talent in traditional country crafts and decor.